Home / News / De Lima to Tagle: “Why is the Church so silent that it seems they have turned their backs?" 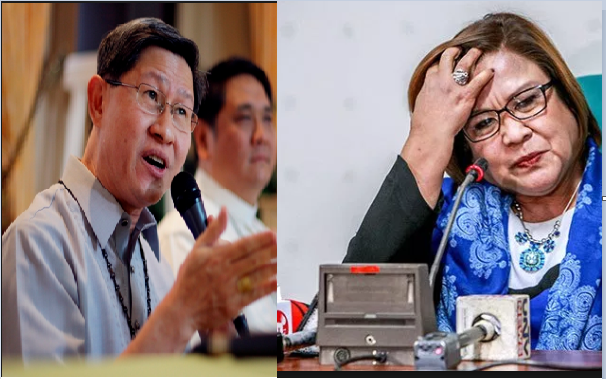 De Lima to Tagle: “Why is the Church so silent that it seems they have turned their backs?" Detained Senator Leila De Lima on Saturday strikes at Manila Archbishop Luis Cardinal Tagle for being ‘silent’ on the kiIlings of three priests in the last six months. Among the slain priests are Fr. Richmond Nilo kiIled on June 10, 2018, Fr. Mark Ventura on April 28, 2018 and Fr. Marcelito Paez on December 4, 2017. De Lima said that Church leaders should take immediate action and exert more efforts to condemn the alleged spate kiIlings of priests. “Where are the words of wisdom from the highest ranking official (Tagle) of the Roman Catholic Church in the Philippines?” she said. “Why is the Church so silent that it seems they have turned their backs, not just [on]their mission, their people, but also [on]their own—the priests who have died protecting and guiding their flock?” she said. “For a predominantly Catholic country, there seems to be a growing sentiment among the people I have spoken to that the Roman Catholic Church is slowly allowing itself to fall into irrelevancy,” the detained senator added. “Save for a few bishops, priests and nuns, where are the Church leaders who ought to be the first to stand [up]and give an answer?” De Lima said. “Why are they silent in the face of those who speak maliciously of God, and the call for good behavior?” she added. “But these days, it seems that the Church, as an organization, has fallen silent,” she said. “Words that defend those who defend the faith and its people. Words that are not just meant to guide the Filipino people toward a stronger faith, and away from morally ruinous mentalities and actions, but to condemn recent events that seem to make religious leaders fair game for killing sprees,” the senator said. “Our people are dying. Priests who defend the people are dying. The President, instead of promising to bring justice to those who are slaughtering his people, is vilifying the victims,” she added. On June 12, Manila Archbishop Luis Antonio Cardinal Tagle highlighted and condemned the kiIling of Catholic priests. On a statement, Tagle said; "Wala nang pinipili: sanggol, kabataan, magulang, lola, pulis, sundalo at pari,"
"Huwad ang kalayaan kapag pinaglalaruan ang katarungan. Inuulit po natin: taliwas sa kalooban ng Diyos ang pagyurak sa buhay." He added. Tagle also called on the government to look into proliferation of firearms in the country. "Baka kailangan suriin ang mga batas at patakaran hinggil sa paggawa, pagbebenta, pagbili at pagmamay-ari ng baril. Huwag nawang dumating ang araw na mas madali pang bumili ng baril kaysa bigas," he added.